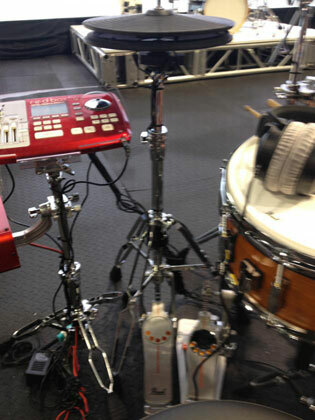 Pearl has a few new updates at NAMM 2013 for their ePro Live line of electronic drums. Quite possibly the biggest update for the ePro is the new TruTrac-Hats. This new hi-hat trigger with integrated hi-hat controller can mount to any standard hi-hat stand and completes the real feel that Pearl states in their advertising. First reported way back in 2010 by Hellfiredrums.com (see: Pearl ePro Live Gets New Hi-Hats?) and then again on November 2012 (see: New Pearl ePro Live Hi-Hat Controller Coming! ), this has been a long time coming in the eyes of many ePro Live users. Not much is known about the hats and so far the only image of them is the picture above. Along with the new Hi-Hat trigger, Pearl has also updated the ePro software (RedBox 2.0) and added another 50 preset kits to the RedBox drum module. Bring the total number of preset kits to 150 (I believe this is the largest present kit totals of any module on the market today). On top of that there is still space for 50 users kits. According to Pearl this is a free software update that will be available on RedBoxSoundshop.com. No date has been announced on the availability of either the TruTrac-Hats or the RedBox 2.0 update. When can a guy buy the new trutrac hi hats? Pearl has not yet announced a date.